The process of tumor formation and deterioration is not only related to the interaction of tumor cells with each other, but also related to the microenvironment of tumor cells and normal cells. In the early days, scientists observed that normal immune cells were infiltrated in many tumor tissues, and it is clinically thought that chronic inflammation increases the risk of developing tumors. In addition, it has been reported that the tumor microenvironment composed of cells such as fibroblasts and endothelial cells promotes the proliferation of tumor cells. Most treatments that target tumor cells are not only highly toxic to normal cells, but also have a significant burden on the body. Moreover, since tumor cells with unstable chromosomes are easy to obtain drug resistance, drug ineffectiveness in recurrent episodes is also a big problem. In this regard, the treatment strategy of destroying the microenvironment composed of normal cells or controlling them appropriately to cure tumors has attracted attention. This paper describes the association between exosomes and the metastasis and deterioration of tumor cells, and summarizes the activity of exosomes in Epstein-Barr virus (EBV)-positive malignant lymphoma. All cells in the organism transmit information through direct contact or secreted proteins such as cytokines and chemokines. In recent years, as a new factor in the transmission of such information between cells, extracellular vesicles have received attention. Scientists have found that extracellular vesicles, like cells, are composed of phospholipid bilayers which contain proteins, nucleic acids, lipids, etc., while extracellular vesicles can also transmit information contained in these molecules at the same time (Figure 1). Figure 1. Schematic of exosome biogenesis. Exosomes arise from the fusion of surface membrane invaginations (multivesicular bodies) and the products of the Golgi apparatus. The resulting vesicles are either degraded by lysosomes or secreted as exosomes. The exosomes are extracellular vesicles that are released from the MVB (multi-vesicular body) with a small diameter (50 to 200 nm) in the extracellular vesicles. In the past, ultracentrifugation or density gradient centrifugation was usually used to separate exosomes, but it is difficult to completely remove impurities in the exosomes. To further investigate exosomes, we have been searching for ways to isolate higher purity exosomes. Epstein-Barr virus (EBV) is the original human cancer virus isolated from Burkitt lymphoma culture cells. CD21 is recognized as an infectious receptor of EBV and will cause conversion of B cells in a test tube. Thus, we know that EBV-encoded LMP (latent membrane protein), EBNA (EBV nuclear antigen) and other nine genes control the activity of intracellular signals and transcription factors, resulting in immortalization and morphological transformation of infected cells. The important point is that EBV-positive lymphoma tissue infiltrates many immune cells, and tumor cells rely on the inflammatory microenvironment to survive. 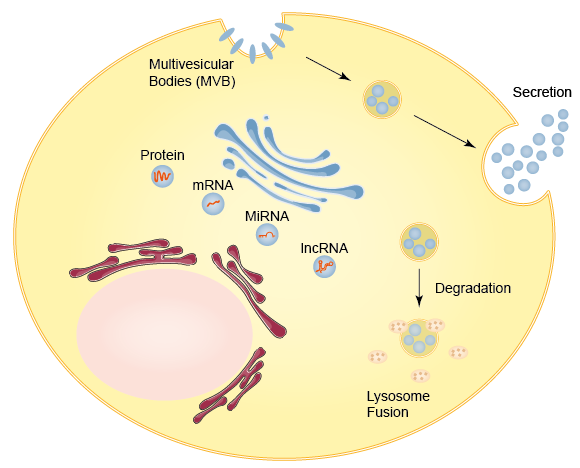 Researchers focused on this point and analyzed the effects of EBV-positive lymphoma exosomes on the microenvironment and the activity of EBV-derived miRNAs as a prognostic factor for lymphoma. There are coding miRNA clusters called BART (BamHI-A rightward transcripts) in the field of EBV’s own genome. This cluster encodes approximately 40 miRNAs, also known as BART miRNAs, which are collectively referred to as EBV miRNAs here. In such studies, the Pegtel team found that exosomes secreted by EBV-positive lymphoma cells contain EBV miRNAs. This report demonstrates that exosomes selectively enter human monocyte-derived dendritic cells (MoDCs) and deliver EBV miRNAs. It is known that exosomes in EBV-positive lymphoma have an influence on the activity of non-tumor cells infiltrated in tumor tissues, and can also cause changes in the microenvironment. Exosomes in lymphoma selectively enter monocytes/macrophages. Scientists have found that exosomes containing large amounts of EBV miRNAs promote the expression of genes such as TNFα and IL-10 in macrophages. The expression pattern of this gene is very similar to the TAM (tumor-associated macrophage) infiltrated in the tumor microenvironment, so macrophages that absorb exosomes containing EBV miRNA may play an important role in the composition of the microenvironment. Intravenous injection of EBV miRNA-exposed exosomes in mice infected with EBV miRNA-deficient strains revealed that mice developed lymphoma and that tumor cells were infiltrated with many macrophages. Finally, scientists also found that injecting clodronate liposomes to remove macrophages from tumors, tumor cells also decreased at the same time. These results indicate that exosomes can utilize macrophages to construct a microenvironment that favors tumor cells during the progression of EBV-positive lymphoma.